Healed by His Creation: Creation Healing: Herbs, Organic Diet, Cleansing, Exercise, and Prayer! 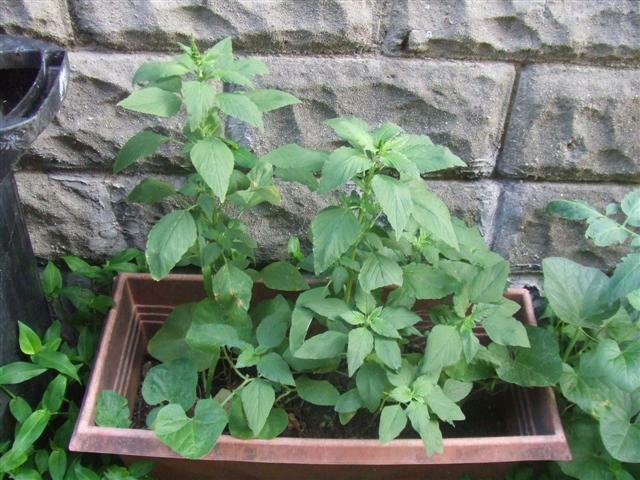 Organic basil plant: organic herbs and diet heal my body! Creation Healing: Herbs, Organic Diet, Cleansing, Exercise, and Prayer! Summary: On July 23, 2007, I received a diagnosis of infiltrating ductal carcinoma with features of tubular carcinoma; tumor measured up to 9mm; grade 1(1,1,1); ductal carcinoma in situ, grade 2, cribriform type; ER PR positive; Her-2, negative. By God's grace, I "went natural", and did the Amish healing plan; after that was done, in 2008, my CA 27 29 was 5.5 (ref range 38.6); the tumor was "no longer evident" on the mammogram & ultrasound. The nurse was petite, with short, dark-blonde hair, and a ruddy complexion. Quietly, she was reading from the Bible in her lap, my biopsy report in her other hand. The verse was a new one to me, and it caught me by surprise. Whatever did it mean for me, right now? The words fell on my ears like sharp stabbing icicles plunging from a roof. Lord, have mercy! I, not someone else, had cancer. It had taken my sister from me twenty-three years previously. My two uncles and a best friend were also buried, following doctors orders for cancer. Now, it was my turn. Or, was it? I woke up the next few mornings hoping it was a bad dream. Surely, I would realize any moment, it wasn’t real, just a bad nightmare. I would laugh deprecatingly: what a silly goose! "You've got to see a doctor!" they insisted. "Well," I replied, "If you can find a saved oncologist, then I'll talk to him." "You need to see a surgeon!" a nurse told me. "That's his business," I replied. "Of course he wants to operate!" "We are sending a wig company to your house with some other representatives." "The wig company? well, I'll shave my head and use my own hair, if I have to." They were dumfounded, but kept calling. "All right," I finally capitulated. "But why not the undertaker, too?" The phone calls ended. A relative called, grief and anger lacing his voice; "Why don't you have the surgery? think of us, too, would you?" One morning soon afterward, I lay there on the futon, having my daily preamble with the Lord. Suddenly, across the room from me, my eyes beheld Him, my glorious Savior, in a shining, glory-filled white robe. His face and hands weren’t visible to me, just the glory of Him, with enormous love and compassion directed right to me. His love for me was so pure, so special, wholly righteous, my Heavenly Father’s love And I had broken His heart, once, as a Christian! How on earth….? Then, I knew. Nothing mattered. He loved me like that. He really did. Live or die, I would be with Him. And He loved me like that. I went to church that week in a cloud of love. The song leader kept glancing at my face. I even felt the glow! For weeks afterward, I was filled with joy. Who could know, I had an earth-defined deadly disease? It was in the Bible, Philippians 1:21…”For to me to live is Christ, and to die, is gain.” I finally understood that, a little bit better. I had been searching the Internet for days on end for an answer to cancer. Hadn’t I already seen what did not work? The graves of the deceased spoke volumes. Whatever they had done, ended under a tombstone. Avoiding that! I thought. No way! I discovered many people had lived past cancer twenty and thirty years. But how? aha, protocols! Flaxseed oil and cottage cheese had been utilized by many believers in Christ, and they had been healed. Dr. Budwig’s protocol! The grape cure had been comprised by Dr. Brandt, and she had rescued many patients from death’s very door. Barley tablets, B-17…but what would I do? What was my answer?. John, a brother with sickle cell, had let me use his colon cleansing products for two weeks. "Death begins in the colon," he said sternly. He said I’d be on cloud nine, cleansing. Boy, was I! That plus my daily 50 mg of 5HTP had me just bouncing through the house. Or, thundering? At 210 lbs., getting rid of toxins was an absolute delight. She shook her head. Was this her negative, abused mom? It didn’t make sense. Now, I had to make a decision. Then, Jackie Velasquez called. There was an Amish healer in Fort Wayne, she said. His name was Solomon Wickey. Still happy as a lark, ridding my body of the toxic overload, I chuckled and agreed. She sounded a little frustrated. Was I taking this seriously or what? My kids called me, one by one. That happens to other people’s moms, not theirs. I could hear it in their voices. One of my sons called. “I heard you were, uh, sick or something,” he stammered. Back on the Internet, I googled ” Solomon Wickey cancer”. Stories of healing came up. People with worse cancer than mine had been healed. Others had been healed of mysterious maladies, without medical remedy. I looked up different types of healing. Quickly, I decided that I would trust prayer and herbs and diet, together. I had done too much damage with wrong foods and chemicals in deodorants, soaps, shampoos and clothing, to expect God to just remove it all. He had totally healed my mitral-valve prolapse, years before, though. My kids had been healed of different illnesses, too. So, I knew He could, I just didn’t think I should ask like that, considering I had played a part in this! Mr. Wickey first sent his opinion that it was aluminum poisoning, which causes cancer, and I ordered and took Bladderwrack, which is a cleanses heavy metals from the body. Then, I requested the cancer protocol from him. He sent it with written instructions. A naturopath helped me order herbs the first time, I found a grocery chain with organic carrots and celery for juicing…and I was off and running. A juicer from a thrift store was seven dollars. “The Lord put that there, just for me!” I said to a clerk. She looked at me, uncomprehending. A homeschool foundation sent funds for curriculum. A generous sister and brother in Christ, with their own struggles, contributed to my cause for health. Mrs. Velasquez obtained vegetables from Amish farmers. The first two weeks, I drank purified water and ate whatever veggies she gave me. I lost close to 10 lbs within a month of eating like a camel in the desert! As the toxins were flushed out by the carrot/celery juice, freshly made, daily,more pounds started dropping, like hail in a storm. One, two, three. I started to love the scale. Before this, I had felt so helpless about my weight! It kept increasing, no matter what I had done! Now, fun time, it was decreasing, to my utmost delight. I thought I couldn’t stand another minute of the vegetable/fruit/nuts/grains diet, sometimes. Oh, for a nice ,hot juicy hamburger full of hormones, on chemical-laden “bread”, with deliciously tasteful chemical-ridden condiments…killer food, but the taste! Yet, that was how my immune system had kept getting worse, until I had cancer. Aluminum in deodorant was tested regarding cancers like mine. Thirty cancers, and all thirty were proven to be caused by aluminum, sometimes called “parabens”, in deodorant. That, plus my weak immune system, made my body a cancer minefield. Now, I had to stick it out, no matter what, for nine weeks of herbs along with 18 weeks of diet/juicing. How would I survive? No toxic church suppers? No birthday cake? No hot, fresh doughnuts…not even one?? By the end of the 18 weeks, I felt like a bird at the door of a cage. Let me out! And away I flew…right to the health store…for more vegetables. I didn’t want to quit! It was so much fun losing weight and feeling great, every day! Who would want to stop? Not I, said the birdie. A budding naturopath met with me to perform biofeedback, and to pray for me, with her hands on my shoulders. A doctor and minister from down South prayed for me by phone. Both times, a feeling like gentle electricity flowed through me! Finally, the protocol ended in December, 2007. Woo-hoo! What joy. In February, 2008, I was granted a CA 27 29 bloodtest for breast cancer, which would also be elevated if other reproductive cancers were present. Well within the reference range of 0-38.6, it returned at 5.5. I was elated. Normal! A mammogram and ultrasound followed in June-July of 2008. The doctor’s first report stated the tumor was “no longer evident”. Then he said, "Oh, but cancer doesn't leave. You still need surgery. I have a friend who's a surgeon." On the report he stated he needed to compare my original films with the latest ones. After doing so, he said the 9mm tumor was gone, but "the spiculated mass hasn't changed", and that the patient needed surgery! Okay, what spiculated mass? if it hadn't changed, where had it ever been mentioned? nowhere, in all of the papers. The only spiculation evident was the scarring from the biopsy. Hello? I know I have a B.A. in Speech/Drama, but I guess he thought it was in Super/Dumb! This called for a second opinion. A friend of the family, a doctor by profession, volunteered his time and effort to view the films himself. His report? He could find “nothing of concern”. Two nurses, one my own daughter, viewed the films. The grayish blob around the clip in the before films was clearly there. However, that murky gray mass around the clip, was nothing but clear, black space, on the after films. No more gray! Praise the Lord! Having lost 40 lbs., I stayed on the diet, losing another 30 lbs. One day, I want to reach my optimum weight of 120 lbs. I basically stay on an organic diet, with little deviation. I try not to cheat myself of good health and long life. When I give in and eat a popular toxic "food", it’s never fun like it used to be. Or was it? I always felt bad afterwards. It was only delicious looking at it, and thinking of eating it. The actual consumption was far less delightful. My toxic eating had been accompanied by toxic thinking and attitude. Once the colon was cleansed, from the inside out, my attitude improved 100%. I’m still a “ditz” where I was, and occasionally grouchy, when it’s very late and I’m extremely tired. However, the joy of the Lord really has more freedom, now. Suffering the shock and trauma of extreme marital abuse, is said to decrease our immune system, also, and transferred stress and anxiety to other relationships. Soul cleanse before the Lord, body cleanse thru the colon, and mental cleanse through positive, Biblical input and thinking…restores what the locusts have eaten. To me, toxicity in eating can even harm good relationships. Toxic food gatherings where I hopelessly gained weight and acquired more proclivity to illness, were not a glory to God, but a tool of Satan. He loves to depress and sicken the very ones redeemed by the precious blood of Yeshua (Jesus)! How much ministering of His love never happened, how much joy was never expressed, how much winning of souls was passed up, because of the trash I was putting in the body that Elohim gave me. What must He think of that? I want to be in Biblical obedience in my eating. My obedience to El-Shaddai in this area looked like crumbs, while the loaf I desired was sinful, chemical-laden, disease-causing “food”. Elohim’s food for me is whole, unaltered by man. Time to confess and forsake the sin, and eat God's way! Praise the Lord!